About KRTS – KRTS Transportation Specialists Inc. Most important, we are a family business, we want you to feel like you are part of the family. In 1989 Kim and Lisa started the business, which today is known as KRTS, out of their house, later moving to a shed in the backyard. 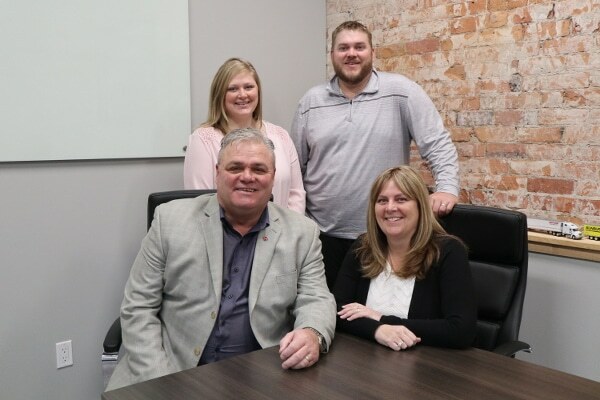 Fast forward 30 years, still in Caledonia but with a facility they are proud to welcome you to and a team of professionals who can help you with all your needs which includes Kim and Lisa’s son Matt (Sales and Operations Manager) and daughter Jamie (Customer Service). Having the two generations together has strengthened our vision to making KRTS better. KRTS is Canada’s leader in the transportation and construction training industries with a network of over 400 companies. Our team at Kim Richardson Transportation Specialist Inc. believes in quality education whether its for training with a company driver or for an individual. With over 30 years of quality service our reputation speaks for itself. Many Transportation and Construction companies in Canada and the USA have partnered with Kim Richardson Transportation Specialist Inc. whether it is for hiring new employees or for training existing employees. It is our knowledge of the transportation and construction industries and our liaisons that allow Kim Richardson Transportation Specialist Inc. to provide the best training available. We have earned our award-winning stripes, one successful client at a time. To continue our role and responsibility as the Transportation Industry Leader in Education, where honesty and integrity is the foundation of our success. Our Core value is People.